Mooi en stevig product. Handig dat je kan kiezen uit verschillende kleuren zodat je elk wapen een eigen kleur kan geven voor in de kluis. Ze passen ook perfect in mijn rangebag. Zeker een aanrader. I very much like the pouch as it fits the pistols niceley, and is very padded and soft as to not mar finishes. ! thing I'd like to see is a small loop at the end where the zipper closes so a lock can be fastened for transportation. this for me would eliminate the need to transfer to another case for transport to and from local matches. This is a great back pack and can easily hold all I need for a typical day at the range. I really like the lower hard walled area and I use two fishing tackle Plano cases to store my ammo and another with tools/cleaning supplies, odd and ends. The main upper storage area is huge and can easily fit my open gun in a soft pouch as well as all my mags, head set, mag brush, extra long sleeve sport shirt etc. The outside pockets have all the other items like stapler, extra staples, targets dots, gun oil, lube, etc. There is also a top/front pocket for paperwork, pens, etc. All in all I'm very happy with it. The overall design is a very good idea - but the quality is lacking in areas. In particular, the zips are crap. Mine lasted 2 years, then the zips all started breaking (teeth breaking mainly, on the corners of the bottom and top compartment). The zips on the Professional series of bags are much more robust. Overall, a very expensive purchase to only have last two years. Great pistol sleeve well padded just needs a pocket for your name. beaucoup de place, compartiment à munition séparé, possibilité de porter en sac à dos, livré avec une brosse à magasin et la poche à eau. bonne qualité et pratique pour le transport et le stand. The new generation of shooting backpacks has arrived, and it is bigger and better than ever! No other comes close! Competitive Edge Dynamics and Double Alpha Academy are proud to introduce the latest and BEST in this style of range bags! Backpacks have a distinct advantage over traditional shoulder-strap bags as they distribute & balance the weight more evenly, making them more comfortable to carry over long distances (often the case on large IPSC shooting ranges). However, standard run-of-the-mill backpacks don’t really cut it. While they may be comfortable to carry, most “Tactical” backpacks do not offer the features and design needed by competitive shooters on the range. Furthermore, they do not always remain upright when placed on the ground. The new CED/DAA RangePack Pro is functionally designed by shooting professionals from the ground up specifically for IPSC/USPSA, and IDPA shooters. It is an extra large backpack, chalked full of design features and accessories for the serious shooter. The backpack is designed to stand upright on its rubberized waterproof base, allowing for easy access to all its multiple compartments. Starting with the large lockable upper compartment, which includes a detachable 7-pocket magazine holder. Additional pockets specifically designed for a mag-brush, hearing protectors and a bottle of Progrip or to store the combination cable lock. There is even a pocket designed for the multi-purpose plastic utility box that comes included. The structured cover of this upper compartment includes a zippered pocket for papers, business cards, and pens, as well as elastic straps for additional tools and accessories. The back panel is designed with dense padding to provide support in all the right places. The thick, densely padded shoulder straps are contoured for the utmost in comfort and function even when packed with 15 or 20 kg of gear. For those wet rainy days on the range, the backpack includes a rain cover neatly packed away in a concealed pocket, always at hand when needed. The rain cover is designed to protect the backpack while being worn by the user giving access to the shoulder straps, even when covered. The large lower compartment is encased in a hard plastic shell, giving the bag strength, rigidity, and structure. This lower compartment can easily be accessed through the large lockable front opening and can hold 500 rounds of ammo plus 2 zippered pistol sleeves, or up to 1000 rounds and 1 pistol sleeve. 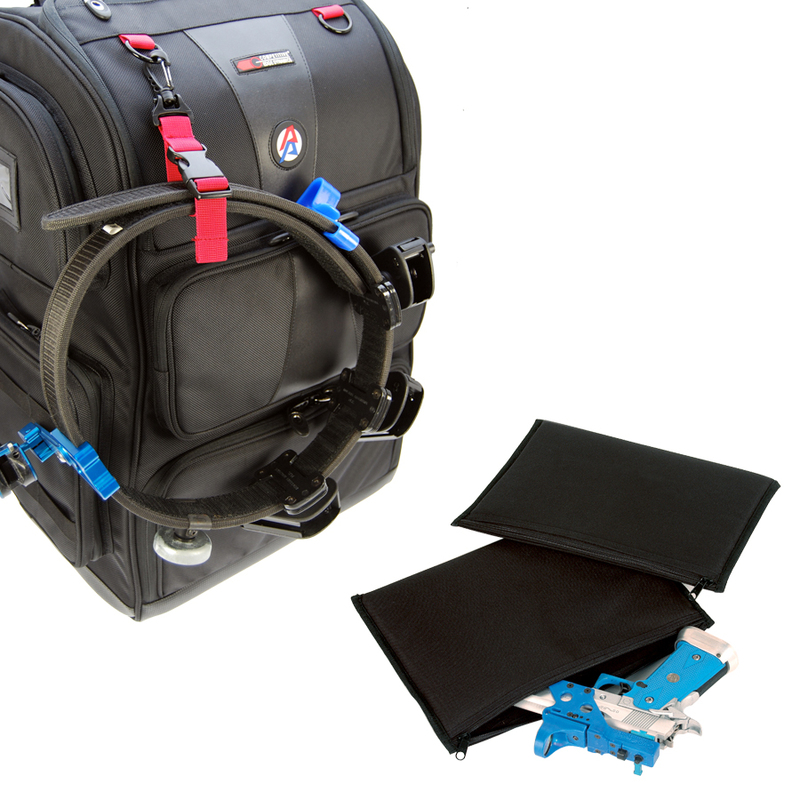 The compartment is even large enough to contain the CED medium size waterproof case! For extra protection of your valuable pistols, zippered pistol sleeve bags are the perfect choice. Made of durable 600D "Cordura" type polyester fabric with dense foam padding, the 9" x 12" sleeve offers excellent protection and ease of use for most types of pistols, including scoped "Race" guns. Simply the perfect way to carry your gun to and from the safety area, without having to haul along your whole range bag.